I've been cycling for over 12 years and have gone through more saddles than I'd like to admit... I've always gone for the curved style saddles, San Marco Regale, Specialized Power saddle, Bontrager Serano saddle and never really felt comfortable on them, it felt like my sitbones were never sitting on the saddle. I finally purchased a flat saddle, Fizik Antares. What can I say, it's the best saddle I've ever ridden, able to raise my saddle and feel more power transfer because I'm finally sitting on the right saddle. Thank you Fizik for making a great saddle. Highly recommended saddle company. The best saddles are the ones you don't notice. I switched from the Antares VS to the Antares and now to the Antares R3 and I'm happy. Was a bit harsh the first couple of rides but after about a week it's even more comfortable than the old Antares. Matches with Team Sky Blue and Fizik SID Blue bar tape perfectly. Saddles are one of those things you REALLY have to try before you buy. I had the good luck of being able to ride one of these for several hundred miles before deciding I thought it was better than my existing saddle. Overall I'm really pleased with the quality and for the price this is done well and light weight. With a few hundred more miles I'm still convinced this is comfortable and nice. My older antares finally gave out. I like the wider platform on this saddle. That being said I prefer the old covering . The new saddle has a microfiber cover that takes a little getting used to. I have got about 500 miles on it and it is feeling better day by day. It always seems to take a while for a saddle to break in even if you replace it with the same model and brand. I purchased this saddle after riding a similiar shaped one for about five months which I felt was comfortable and supported me well. The way Fizik constructed the Antares with flexible wings has really improved my comfort on long rides which is what I was looking for versus weight savings even though it weighs 135g's less. The product is great and when I sat on it is seemed to fit me well. My only complaint is the rough material section. I move a lot in the saddle (probably too often). It would seem it was supposed to add friction so you can push back on the saddle for power peddling, but I am afraid they will wear out my shorts. Will probably try and Alicante next. 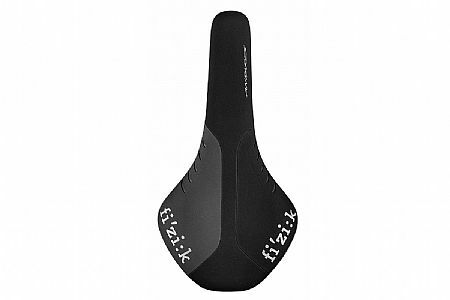 Quality saddle, but disregard Fizik's fit guide. This Antares saddle works well for me. Although if I went by Fiziks guidelines I would use an Arione. I tried the Arione, and did not like it even though I am very flexible. The quality of there saddles is very good, the weight is low, and I hope to get many miles out of this one . Price could always be less, but product is good and comfortable on long rides if fit is good for your body shape.